All the planters are made from pressure treated wood, they’re a minimum of 22mm thick giving you a longer lasting planter. 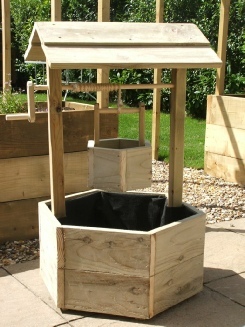 From a square planter to a wishing well, from a rectangle to a wheel barrow, we have planters of many shapes and sizes. If you see a planter you like but prefer it longer, shorter, narrower, deeper, not a problem, planters can be made to your specific requirements. How about a planter as a gift? We can engrave names and messages on them, plant them up ready to go if you prefer. This is just a small selection of what can be made, any questions do not hesitate to get in touch. Large Wishing Well. Plant in the base and in the bucket. Looks stunning with a mix of bedding and trailing plants.